While opportunities don’t always present themselves, I always try to help my clients find any and every way to get double-duty usage out of something used at their weddings. Altar arrangements used to flank the entrance to their ballroom, aisle clusters secured to the backs of bridal party chairs, cocktail arrangements relocated to the dessert buffet etc. For a former, favorite (sophisticately preppy) client, I had a pair of scripted monograms made for the church. We sneakily added these married monograms to the beautiful camellia wreaths adoring the church doors, as guests witnessed the I Dos. After a shower of fuchsia rose petals cascaded over the happy newlyweds during the Grand Exit, the monograms were moved to the reception to ‘secure’ gorgeous, billowing navy curtains adoring the French doors used as a backdrop for both the cake (deliciously Sweet Mandy B’s) and the intimate head table. The cutie monograms were then packed up for the couple to take home and use as artwork in their home, as a special reminder of their dreamy day. Things worth doing are often worth doing twice, no?! I am lucky enough to have a mom that has been my favorite friend for as long as I can remember. I appreciated her as a youngin, as a teen and adored her in college. As a mom, myself, I cherish her even more. Looking back, she made being The Best mom in the world seem like the most effortless and easy role….something I know, first hand, couldn’t possibly have been! Seeing her with Carter floods my mind with memories of the absolute dream childhood she provided for my brother and I. Mom is strong, loving, generous, unabashedly goofy, caring, gorgeous, selfless and the least lazy person I know! Such an example for me, as I try to navigate my way through mommyhood. My heart explodes with love and appreciation for my mom! Whether you’re a New Mom, an Old Mom or a Future Mom – Happiest Mothers Day to you all! Hopefully someone special spoils you rotten! It’s Finally Here, My Dears! As life as a momma, wife, wedding & event planner and – as of late last year – a new business owner(!!) snowballed into total overload, client and family life continued to take priority. This left no time to keep up with the sweet and simple little blog I started back in 2008. 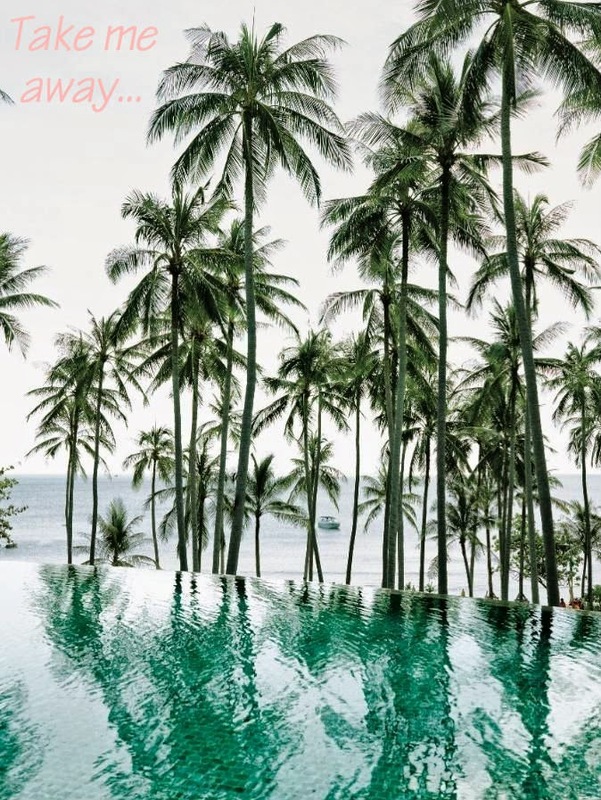 I am really excited to get back into the swing of things, sharing all sorts of dreamy inspirations that always Celebrate a Life Well Styled! Many say this is long overdue. I say the timing is just right! 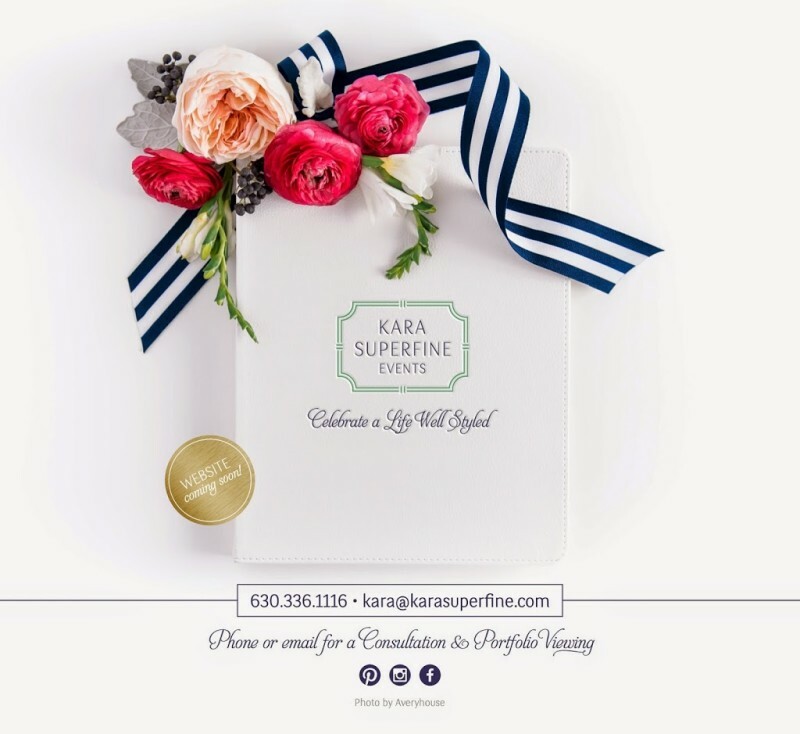 I am so thrilled to announce the launch of my very own wedding & event planning company, Kara Superfine Events. Kara Superfine Events works with discriminating clients to plan, design and produce incredible celebrations that are tailored specifically for each individual client. Website forthcoming, but in the meantime, feel free to reach out to set up a time to connect about your wedding or party. I started this sweet and simple little blog 6 years ago, before Life grew so exquisitely full. While I haven’t put together this year’s Easter Centerpiece yet [sneak peak: coral, celery & grey!] 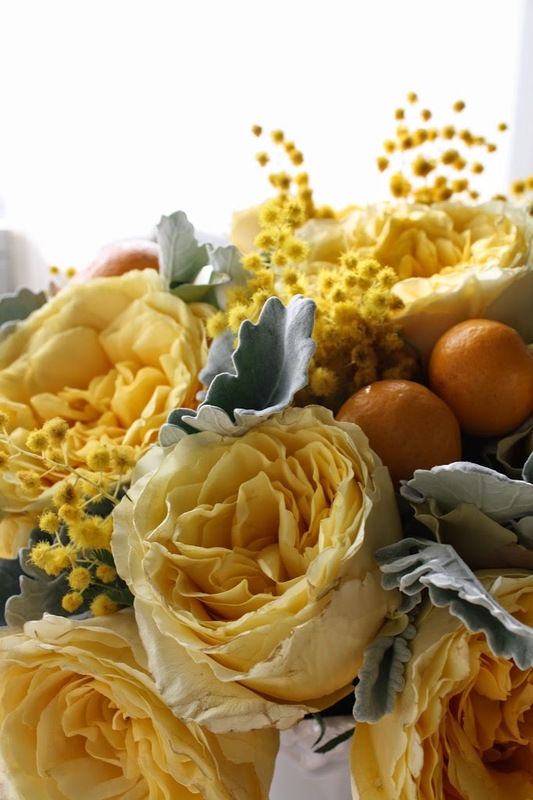 – here was last years collection of sunny yellow Garden Roses, Dusty Miller, Mimosa and Kumquats. At least it’s not snowing at the moment here in Chicago!…but seriously, friends, our frigid temps and uninspiring sogginess has me counting down the days [minutes?!] until our little holiday to Mexico next month! It’s rare I get a moment to share these days! Between juggling my favorite little man and a full load of fabby clients, the balance is a constant work in progress! …..I swear I’m still around!…..
And still FULL of gorgeous ideas and inspiration. 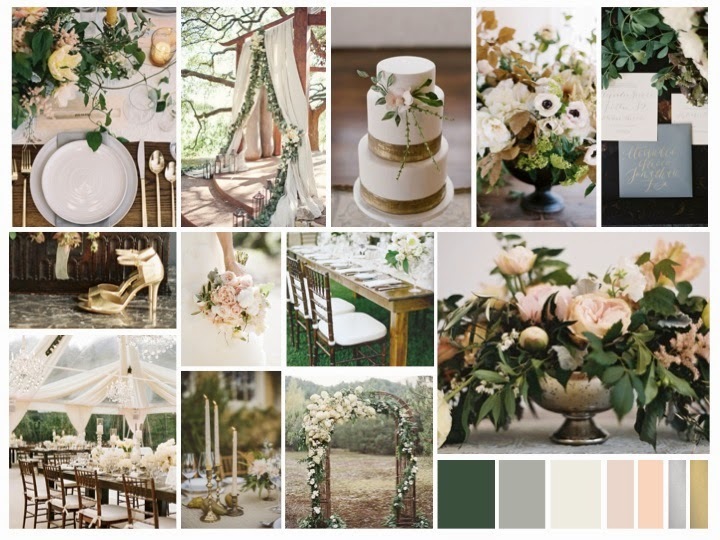 In fact, I wanted to share some of the Inspiration Boards I’ve created to help support the planning process for a few clients this year. 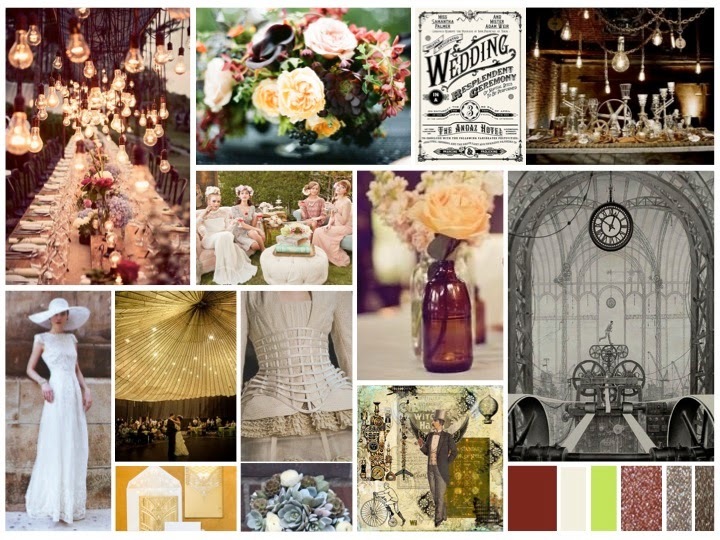 One of the coolest clients ever, this bride loves an industrial, edgy look – with vintage touches and beautiful oddities. 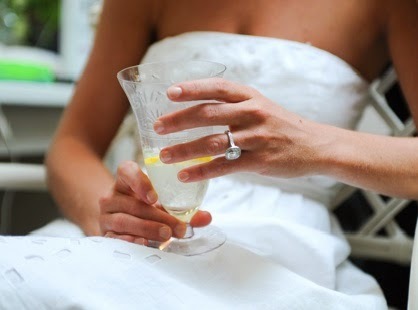 And this sweet bride was inspired by the ring her dreamy man proposed with: A generous oval solitaire – an example of classic beauty, with an element of unexpected style. 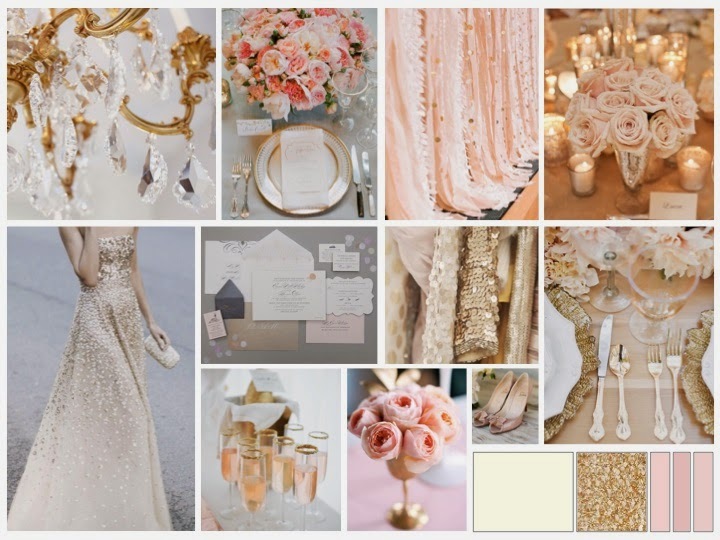 Her clearly romantic palette of creams, blushes and metallic golds will warm up her sleek venue beautifully! And remember this favorite? 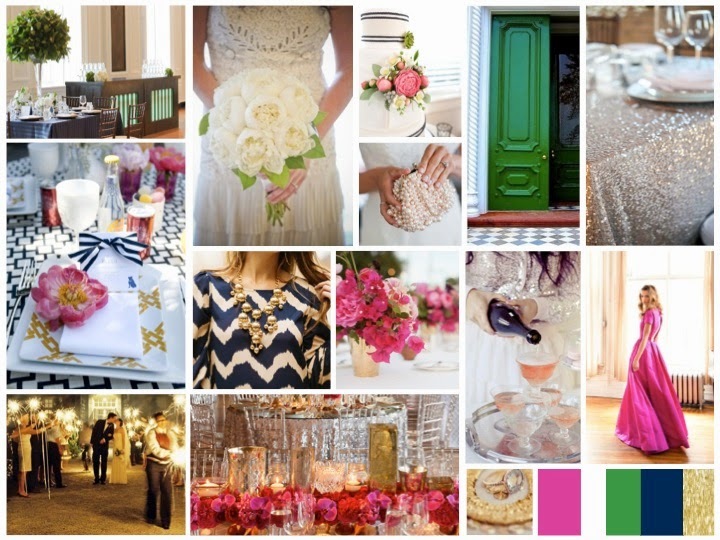 Stay tuned for the unveiling of the wedding photos – both here and on the Bliss Blog! Early October, my favorite little man turned One! Although it was peppered in between a few lovely fall client weddings, I still managed to whip together a little celebration in honor of the perfect creature that changed my life forever. Carter was turning 1 – and let’s be honest….what are one-year-olds really into?! Carter isn’t yet into trains, or trucks – could care less about Sesame Street or scooters. However…he does have One True Love….Our beagle (mix), Illiebelle!And so, an Illie-theme was quickly established! My amazingly talented artist friend, Liz Dixon, designed the invitations for us. Similar to a pair of wreaths on the front doors of my in-laws, two Illie silhouettes (also created by Liz) were the first to welcome friends and family. The birthday boy posed with momma and daddy in front of the dessert buffet. The party was called for 1:30pm, so while guests weren’t expecting a full meal, I prepared a food buffet fit for adults and kiddos alike. For the elders, I had a bruschetta bar with four different flavors – marinated skirt steak, arugula, caramelized onions and gorgonzola – BBQ pulled chicken – tomato, basil and fresh mozzarella – seasonal honeycrisp apple, ricotta, crispy prosciutto, parmigiano reggiano and honey drizzle. I also made a farro salad and a fall salad. Bowls of cheerios, yogurt bites and Plum Pouches kept the kiddos satisfied until desserts. Stickers made on zazzle featured Illiebelle’s silhouette (also created by Liz!) and adorned paper cups for the bevvies. The kids weren’t the only ones that had fun…champagne cocktails and beer were on hand for the older kids. Carter’s Corner featured toys galore! The dessert spread was positioned in front of a collage of paper fans and featured treats from Sweet Mandy B’s, green and blue candies, legendary peanut butter squares made by my mother in law, and of course a cake made for one happy little boy. Oh! And the most delish fall pumpkin cupcakes made by Jenn (find the recipe here!)! Of course Carter needed a wardrobe change before his Smash The Cake experience! I had his bloomers, suspenders, bow-tie and hat made on etsy. Guests took doggie-bag favors home with them…Puppy Chow made by my mother in law and cookies decorated with Illie’s silhouette. And coordinating stationary let our generous friends and family know how much Carter appreciated their thoughtfulness. I have always LOVED hosting parties – and to be able to throw one for my SON (ah!) was a pretty amazing experience! As the autumn season sneakily approaches, my time continues to be limited – happily balancing the amazing life of being a mom while also tending to some really wonderful clients. Working from home can be viewed as a luxury – there is no one that spends more time with my son, something that I absolutely won’t sacrifice – but it is also incredibly difficult to find time to accomplish everything on my massive work, family, and personal to-do list. Unfortunately, while I still have loads to share and am continually inspired to do so, blogging [in any sort of regular sense] is what I’ve chosen to scale back on, in order to help to find time for my family and my clients. I will still share when I’m able, so don’t forget about me! !